Earlier I wrote about the changes that Alaska Airlines is making to first class upgrades, including a change in how upgrades are prioritized, the introduction of upgrades on award tickets, and a change in which fare classes are eligible for instant upgrades. However, it looks like there’s a lot more to this announcement that I didn’t initially see. Late last year I first wrote about how Alaska Airlines is introducing Premium Class, which is their version of extra legroom economy, similar to American’s Main Cabin Extra, Delta’s Comfort+, and United’s Economy Plus. Alaska’s Premium Class will feature an additional four inches of legroom, plus complimentary drinks and snacks. So it’s not just more room, but also more service, much like what’s offered in Delta’s Comfort+. 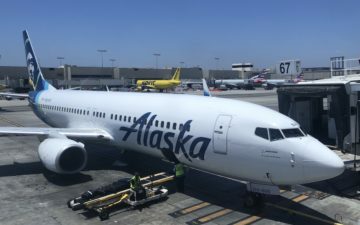 The first plane with Premium Class is now flying, though over the next year we should see a majority of Alaska’s fleet configured with this product. As far as Premium Class goes, we should see three rows of it on the Embraer 170, five rows of it on the 737-800, and four rows of it on the 737-900. 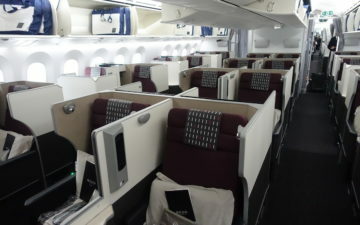 While Alaska isn’t yet selling Premium Class, they’ve now announced how upgrades to the cabin will work going forward. In other words, only MVP Gold 75K members will receive upgrades at the time of booking on all fares. Meanwhile MVP Gold members won’t receive them at the time of booking on some discounted fares, while MVP members will only receive them at the time of booking on the most expensive fares. MVP Gold 75K and MVP Gold members can take one companion into Premium Class for free, while MVP members can’t take companions into Premium Class for free, even within their upgrade window. Alaska is continuing to do more to differentiate their MVP Gold 75K and MVP Gold tiers. On one hand I’d say that the news here is mostly positive, given that nothing is being taken away from existing members (they can continue to select exit row seats for free at the time of booking, as before). However, Alaska is doing more to differentiate passengers based on which fare class they book, which shouldn’t come as a surprise. What do you make of Alaska’s Premium Class upgrade policy? What about upgrades to first? This whole “premium economy” on domestic routes is really quite ridiculous. A free drink and a free snack, not even a free meal? What rubbish. @Ben: they’re selling it already, for departure date >= 5th Jan 2017. The first couple of images look like the main/main extra seats on Virgin America. Do you think this indicates a shift toward more similar onboard experiences? Why is it so hard for other airlines (looking at you Delta) to implement the same optionalupgrade to middle seat? I think this is great – more fare classes included than I would have thought. It’s not clear to me (and others) if the premium upgrade will actually be optional and not toss your seat assignment right away. As a 75K, I don’t want to be “upgraded” out of exit row….I already get a free drink. I don’t care so much about the snack box and don’t need more drinks. Alaska rep answered my questions on FT: Row 6 (bulkhead) is considered PC as well but exit row is not and you would get upgraded out of it, unless you choose to opt out of the upgrade which I believe you can do when you book (there is currently a check box for first class upgrade request, so I presume there will be another for PC upgrade request). So I guess if you get a seat you like, then don’t check the PC upgrade box but keep the first upgrade box checked. Yes, many downgrades have been occuring as those aircraft roll out. Some upgrade inventory is also being held back. Although extra legroom is certainly nice, I’d really prefer a wider seat configuration. The one thing I really don’t like about flying coach is having to literally rub shoulders with the person seated next to me and fight for the armrest. It never fails that I have some huge person seated next to me and they spill over their seat into mine. So, I end up leaning way out into the aisle and, well that doesn’t make the FAs or fellow passengers very happy. So… what I’d REALLY like to see for 75k Gold members is a guaranteed empty middle seat next to you. I would never complain about coach again. Alaska can keep their almonds and cranberry snacks (although I’ll take the chocolate!). I’m Gold and just purchased a seat from SEA to FLL. I was able to select the exit row for free as before (blocked out for MVPs), but no longer row 6 🙁 which was my favorite row. Also, a few seats in front of the exit row where not “Premium” but were reserved for MVPs as before. When you buy the ticket it has a check-box to add you to the First Class Upgrade list (like before) and a new Premium Class upgrade list. From what I read on their website 75Ks get upgraded right away to Premium if they want it. What I don’t like is I’d rather stay in the Exit row on the aisle than get a Premium seat on the window (I get claustrophobic at the window when the whole row is filled). They should allow us to set preference of the auto upgrade. For business travelers, our food and (sometimes drinks) are free anyway because the company pays for meals during business travel. Most of the business travelers are the ones with the MVP Gold+ memberships. So, I’m not clear how this benefits MVP Gold business travelers such as myself. I already get a free drink so what? If the seats were wider that would indeed be a big deal. I do not want to be upgraded from an aisle seat to a window seat. And I do not want a bulkhead. To me this seems like a way to weasel out of occasionally upgrading MVP gold and gold 75s to first class. It’s a downgrade of MVP gold to me. Now I understand to a tall person the extra legroom could be a godsend and I am happy for them. But it matters not in my case. The extra room is nice, but NOT worth giving up the Exit Row, especially for 75K’s. The snack box was small and not a “meal.” I wish they would do what United does for 1K’s…comp drink AND comp meal. I’m “downgrading” myself back to the Exit Row when I can. Removing 4 first class seats out of the most common plane in the fleet (737-800) is a massive mistake for Alaska. Let me be perfectly clear: the main reason I give an airline my loyalty is for first class upgrades, period! 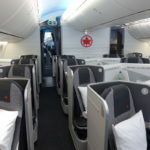 I have already experienced that it is more difficult to upgrade to first class, and, therefore am no longer loyal to Alaska – after 12+ years of flying 75K! Delta and United both have 737-800 configurations with either 4 or 5 rows of first class + more economy plus rows than Alaska has premium. As a platinum 1K on United I get free drinks and food in coach and have a 100% higher chance of flying first class. It seems as if Alaska is trying to make a “main cabin extra” product here, but I suggest their executives fly Virgin America to experience that product before they alter it. First, VA’s coach product beats Alaska’s first class. Second, A-320 series aircraft have 1 inch wider seats in coach than does the 737 – making the “main cabin extra” product more appealing. Third, VA food and beverage and ordering process are far superior. Not sure what the plan is for VA, but this type of trick will instantly alienate the VA clientele who are accustomed to a higher-end product than Alaska. more of american nothing. A tiny box of salty junk, a free alcholic drink when the cart comes along, and 4inches more. Not a real lunch/supper, not a real non economy/coach seat, etc…75$ extra for what really? another us scam. I am sort of confused as to what the extra $39 upgrade charge is getting me. I am placed in the middle seat of an exit row. I am a bit disappointed with the airline for misinforming me of the benefits included in my upgrade. The new system is a joke. I’ve been Gold for 10 years and used to make it into first class about 1/3 of my flights. This year I haven’t been upgraded once. I guess I’m supposed to feel special sitting in row 7 which is now premium which I could sit in anyway for the last 10 years. Am really thinking of changing to American Air. They fly small Jets to Bend and are frequently cheaper. Why not..I can sit in there row 7 and never get upgraded for less money. Sitting in 8D after paying $79 to upgrade. I almost thought this seat assignment was an error. Not planning to do this again. 15 Premium seats open when I checked in. Both wife and I are MVP using companion ticket and have not been upgraded, 20 hours before departure. We are first and second on the upgrade list. They must be still hoping to sell the premium seats.